I’ve had days of downtime on all of my websites which had domains registered through RegisterFly – because of a payment dispute on a single renewal. It’s just insane. I had a domain that was expiring and I was unable to renew it because their system is buggy as hell. First of all, it had auto-renew enabled, but I still got daily e-mails telling me the domain was expiring and I needed to renew it NOW. Well, trying to do so manually I got a random error message AFTER they had charged my card. So, finally after trying to renew using PayPal and having spent about $50 in total on this renewal – without getting the domain renewed I decided to do a reversal on the PayPal. I got an e-mail saying ALL my domains were transferred to the ‘fraud’ account, and that my account was locked. Yes, that’s right, all my domains. What did this mean? Well, I soon discovered when I tried visiting one of my sites – e.g. 43min.com linked to flyparking.com and looked like a spam page. And so did all my other sites. Ok, so I e-mailed [email protected] and asked what I needed to do to get my domains back. No answer. Since phone support only is available 8AM to 12AM EST I needed to wait to the next day to contact them. Still no answer from the ‘Risk Department’. Since I’m located in a different timezone I called support as soon as they opened (which was 14:00 local time). It felt like ages. After waiting half an hour, I got to some guy who told me that only the “risk department” could handle suspended accounts, and they were only available through e-mail. Thank you very much! I told him that Risk Department did not answer my e-mails, and asked if I could speak with his supervisor. Well, turns out he was the ‘team leader’, there was no one else there to talk to. In addition he could inform me that my account was suspended because of “Paypal reversal $17.98., $100.00, $25.00”. This is an outright lie – I only did an reversal on the $17.98 amount, and I’ve never used PayPal to pay $100 to them, so it’s also impossible. He advised me to send another e-mail to risk, and also FAX them. So I did. One e-mail and one fax. Still no answer from risk. Since it’s saturnday it means their support line is not open. So all I could do was e-mail risk once again. I also e-mailed [email protected] to ask them why the Risk Department does not answer mails, and cc’ed it to [email protected] which owns RegisterFly. Yes, desperate, I know. Your registerfly account has been suspended. Kindly contact [email protected] for further assistance. I do not think they could be more annoying, even if they tried. Still no answer to any of my e-mails. This day however, someone was actually online on the support chat (and responding!) and he told me that I could call the Risk Department. Amazing – so I did. After waiting 50 minutes in line I got some guy on the phone. I was very calm and asked what I needed to do to open my account again. He told me that I should never, ever do a chargeback with RegisterFly. It was against their rules. So, since I had done such a thing I would have to pay a $100 fine in addition to a $25 fee and the money I had ‘charged back’. To his credit, I managed to explain the situation – that the only reason I did a chargeback was that renewals didn’t work and I promised never to do it again. Well, it turns out that he knew this was a problem, and let me go with a warning, just this one time. I’m so grateful. So, my webpages were still pointing to flyparking.com and showing spammy pages. I asked the support chat why I didn’t see any domains. They told me the risk dept. handled the transfer of domains back to my account after it had been opened. So, I called back the risk dept. and asked why I’d see my domains. It turns out that the guy at the Risk dept. doesn’t know anything about that, he just opens suspended accounts. “I’m sure it will get done” was all he could give me. It’s all just a mess. .. and finally, 4 hours after Risk Dept. opened my account again, I see my domains. Of course, they still use RegisterFly’s nameservers. I had to update the nameservers for all my sites myself, to get them back to the way they should be. It took about an hour to get this done. I just lost my posting….Argh…Suffice it to say that you probably ought to check your contact information for each of your domains. For example, I checked the whois information for 43min.com, it shows the registerfly fraud unit ([email protected]) as your Administrative and Technical contact. Not a cause of alarm if you can still get to the domains with your control panel. But updating the contact information will become important when it comes time to transfer your domains, as the process will typically involve sending confirming emails (typically to the person listed as the Admin). I use domeneshop.no for all my domains (but one – which uses godaddy), and I am very satified. They are a bit more expensive but you get so much in the package that I think it is well worth the extra. For instance, free dns (even primary, but I use my own and theirs as secondary), free backup mail server (set MX with higher/lower priority in DNS) that keeps you mail if your mailserver goes down, and then delivers them when it’s back up + more. I had a similar experience. They have billed me wrongfully 5 times. The first 4 were reversed and I am still waiting on number 5. And you are right, their cpanel is apparently just a form with values passed into the ether. Buggy does not even cover it imo. 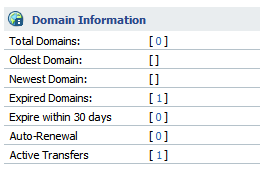 Got all my domains out except one that was about to expire and thus not eligible to transfer. Looks like it’s now renewed, only took a couple of months, and on it’s way out the door. Thankfully. I chose Dynadot as my new registrar. Tempted to put all in one pot with the .no domains at Domeneshop, but they are simply a reseller of other TLDs, so why pay double, eh? Good luck. Life is too short for Registerfly(TM). RegisterFly is the WORST registrar out there! I can’t believe that ICANN would accredit them. I don’t think they are frauds. I just think they are in WAY over their heads. I picture a couple of geeks in a garage raking in the bucks as their cheap Russian customer support vendor screws up all their accounts. Avoid RegisterFly at all costs!!!! !